Is your partner a bad influence? Getting into a relationship and spending a lot of time with someone means that at some point you might have to compromise a few of your own hobbies and adopt some of your partners’ (unless the two of you are exactly alike). Some hobbies and habits that you adopt from your partner can be good while others are actually very unhealthy - and you might not even realize it at first. So, is your partner a bad influence more than a good one? Here are a few signs. Does your partner make you feel silly for wanting to try healthy things or wanting to keep up with the healthy habits you had before dating them? Think about whether your partner’s opinion about some of the things you do actually discourages you from doing them - whether this is exercising, practicing sport or anything else you’re good at or even simply eating right. Your partner might encourage you to try certain things they know you don’t enjoy, like smoking or drinking alcohol. They might make you feel like you're overreacting if you say no or if you tell them you’re not okay with something they want you to try. They might also tell you stuff like “it’s just for today” or “it’s just a little bit”. Your partner doesn’t seem to have any intention of improving their habits or getting rid of toxic behaviour. When you do confront them about it, they get upset, bring up your habits or say things like “you knew I was like this when we met”. You find yourself spending more and more time with their friends instead of your own. This might make saying no to certain things even harder because your partner is more likely to spend time with people who engage in the same behaviour as them. This makes it more likely that their friends might pressure you too. Other people have noticed that your behaviour has changed as well or make comments about how your partner is influencing you. But you’re making more and more excuses for your partner, saying it’s your decision at the end of the day or that your partner’s behaviour is not all that bad. 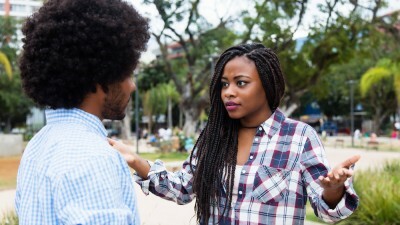 If you start to notice that your partner is keeping you from doing things that are good for you and influencing you to do things that are bad, talk to them about it. Let them know that their behaviour is negatively affecting you. If they are aware, they might try harder to work on getting rid of their own bad habits. If they still refuse then it could simply mean they don’t respect you or the relationship. At the end of the day Choma, you should be in a relationship that affects you positively and not negatively. Always do what is best for your own health and for your own future.